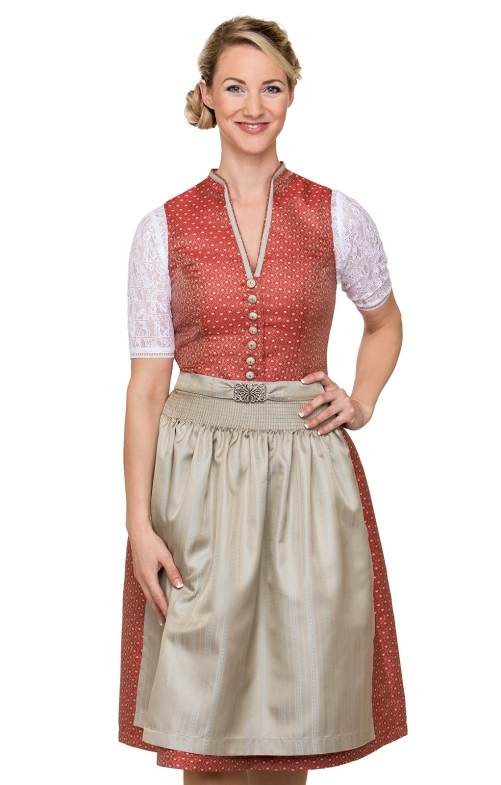 Midi Dirndl Janine for women from Stockerpoint in rouge and taupe. The classic dirndl with an exclusive motif captivates with its high-necked V-neck bodice. The classic raised collar is decorated by a contrasting coloured ribbon and high-quality buttons. The feminine, pleated skirt is stylish and fitted with a side pocket. The dirndl is rounded off by a classy apron made of high-quality striped jacquard and a trendy metal clasp.